Peace? Peace. I hate the word, as I hate hell, all Montagues, and thee. 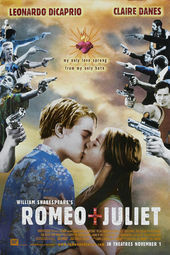 We had to decide how to communicate [Shakespeare’s] prologue…setting the film in a modern day world, we decided to use the media. The idea is to find modern images and equivalents that could decode the language of Shakespeare. What’s interesting here is that…you hear the prologue once and when we go inside the news report you’ll hear it a second time. The same speech appears twice to give the audience the chance to acclimatize their ear to the language. Regarding the violent footage: Most people think it is real riot footage. Most of [the imagery] is of Mexico City shot from helicopter and staged behind the studio backlot. There is no library footage at all. We shot every frame that is in that moment. Regarding editing: The constant invention and reinvention…the moving of beats…there’s a lot to be said about that opening overture. That was something totally constructed and driven by Jill [film editor Jill Bilcock]. For our way of working it is an endless ongoing process of building, testing, criticizing and improving. We had many versions of the start of the film. There was a time where we didn’t trust the text…we were making a lot of excuses and felt enormous pressure that the audience simply wouldn’t understand the heightened world we had created. We finally realized that if you create a world where things were made clear [then] Shakespeare’s language would tell the story.